Homemade Grill Plans WITH ROTISSERIE SPIT AND ROTISSERIE RACK! Build from scrap and salvaged materials. 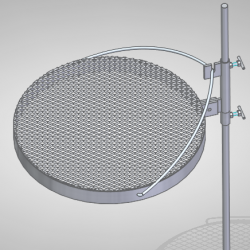 These are complete thorough plans for building an oil drum bbq grill, with rotisserie spit PLUS a rotisserie rack! 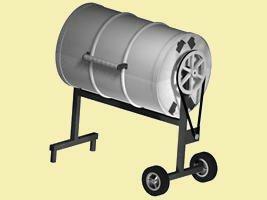 These are the same plans as our oil drum BBQ but we have also included bonus plans for building a rotisserie rack. 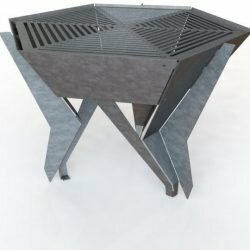 Plans for Building a BBQ Grill Rotisserie Charcoal Grill (Oil Drum BBQ) WITH BONUS Rotisserie Rack!! Plans include spit rotisserie and RACK rotisserie, this would work great for smoking over low heat while your racks rotisserie around with your favorite cut of meat such as chicken or baby back BBQ ribs!! Excellent For All Types Of Meat! 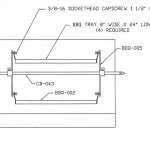 Detailed Plans Include Where To Get Some Parts FREE! ROTISSERIE, BBQ GRILL Rotisserie Rack all INCLUDED! 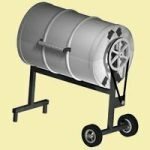 BBQ Drum plans show how to build & use with either 110V or 12V for remote use at your cabin, shack, tailgating party or wherever! 38 Detailed pages of plans that show you exactly how to build this BBQ Grill and Rotisserie.? These are Plans for Building a Charcoal Grill. With this grill you will be able to grill on it, Rotisserie up to 2 full sized Turkeys at once, you can even cook indirectly, add wood chips and smoke your favorite fish!!? Portable to bring anywhere you want!? Plans show individual piece part drawings for ease of building. 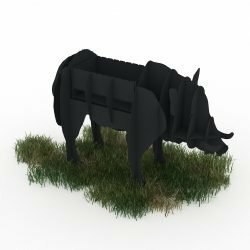 The Plans for Building a BBQ Grill – Plans for Building a Charcoal Grill & ROTISSERIE are very detailed, unlike other vague information you find on the internet. A great way to make extra money. We have built and sold many of these over the years.? Many parts can be obtained locally for FREE.? Once people taste the Rotisserie Food from this grill they will want one for themselves. Make extra money in your spare time! Purchase and start building today.? 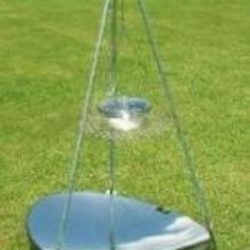 This unit is made from any 55-gallon steel drum. 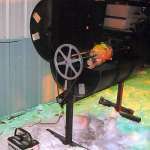 The rotisserie shaft is made from stainless steel and has a rotation of approx. 2 RPM. This allows for evenly grilled food.